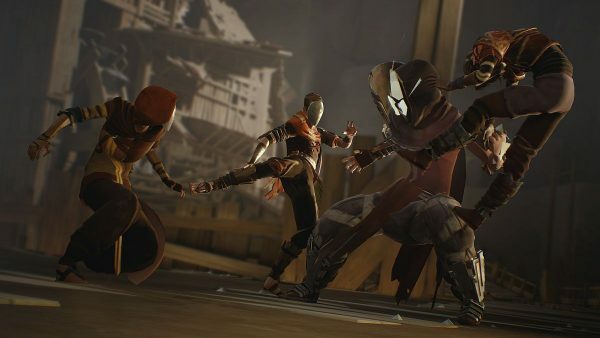 The Absolver Downfall expansion will be released for free in September. Absolver Downfall is a free expansion coming to PC and PlayStation 4 with a new gameplay mode and combat style, school challenges, new equipment and more. According to the Sloclap development team, an Etheran called Iktar has learned his sibling, Arcell, is spreading Gleam in the Adalian mines. Arcell is gaining power over the Lost Prospects and it’s up to the player to stop the madness, lest the barrier to the Fold shatter. A path to the Fold and to Arcell can be found in the Adal mines, beyond the Underground Temples. It’s here players will battle as a solo warrior or in online cooperative play. Absolvers will be tasked with collecting Gleam from infected Prospects and transforming it as a reward for their deeds. The more Gleam collected, the more powerful the player will become in order to defeat the Corrupted, and Arcell. Each run through the Mines and Temples will be a “unique path through a variety of challenges,” and situations. Upgraded enemies, and three epic boss fights will test the player’s resolve. Along with the new gameplay content comes a new fighting style. The Faejin Combat Style was inspired by Bruce Lee’s Jeet Kune Do. The new style blends defense and offense with “percussive strikes and fluid power.” It will be a complex style for experienced Absolvers, with a variety of defensive abilities relying on both input and stances. Faejin will feature 26 attacks for bare hands and wargloves, alongside 15 sword attacks. In the Downfall expansion, a new way for players and Schools to compete with each other will be introduced. School Challenges will be made available to players who have reached Disciple rank in a school, or who are Mentors. Players are able to accept the challenges using their school’s decks and powers in 1v1 Combat Trials. All solo and collective wins representing one’s school count in the School challenges. This will earn players “fresh rewards every three weeks,” at the end of the season. New equipment is included in the Downfall expansion. Players can expect six full sets equaling 51 total pieces of equipment. Two prestige variants of existing sets will be available in the Essence Shop along with original emotes. Six new emotes and three new PvP intros will also be available in the shop. New masks can be found in the Mines of Adal alongside new wargloves and swords. Below is a recap of the aforementioned content for quick reference. Downfall Mode: Absolvers will face their toughest challenge yet as they battle through the new Adalian Mines as a solo warrior or in online cooperative play. Each run through the procedurally sequenced mines and temples offers a unique path through a variety of challenges against upgraded enemy combatants and three intense boss fights. Faejin Combat Style: The new Faejin Combat Style blends defense and offense with percussive strikes and fluid power. The new approach is a complex style for experienced Absolvers, featuring shifting defensive abilities and two dozen attacks for bare hands, wargloves, and armed combat. 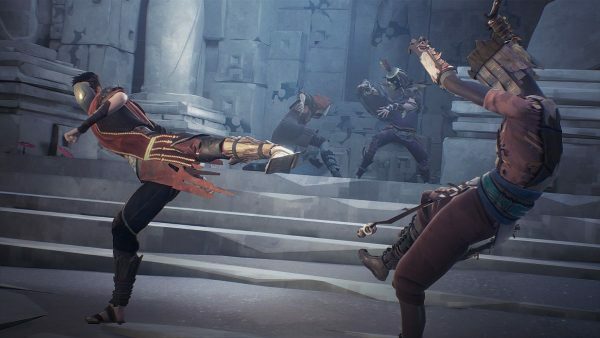 School Challenges: Absolvers who have reached the Disciple rank in a school can participate in School challenges, by using their school’s decks and powers in 1v1 Combat Trials. All wins representing one’s school count in the School challenges, with individual and collective performances of the schools bringing fresh rewards every three weeks, at the end of the season. Absolver is currently free for PlayStation Plus members through July, and a special content pack is now available for those who wish to support development. The Adalian Forest DLC contains variants of the Forest Caller and Dancer sets, a new sword based on River Gladius, and five new emotes. These items have the same stats as items already obtainable in-game, and won’t offer a gameplay advantage. Those who wish to show their support can purchase the Adalian Forest DLC on Steam and the PlayStation Store next week for $2.99/€2.99. Absolver Downfall will be released September 25 as a free update to existing and new players alike.